IO Interactive has also canceled all projects in development so that it can focus on the creation of a new Hitman title. 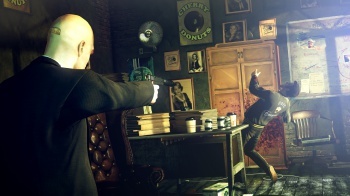 Danish developer IO Interactive has become the latest studio to be gutted by staffing cuts, as parent company Square Enix has confirmed "significant changes... as we align our business against a changing and challenging market." "The studio will focus resolutely on the future vision for the Hitman franchise and is in pre-production on a new AAA Hitman project," Square Enix said in a statement. "However we have taken the difficult decision to cancel other studio projects and initiatives at IO and reduce the workforce in this studio, which will impact almost half of the employees currently at IO, as we make internal adjustments to face the challenges of today's market." The publisher said it was "extremely grateful for the hard work" put forth by all those who no longer have jobs, and that it is trying to reallocate staff to other Square Enix studios where possible and looking for "outplacement opportunities" with other companies where it is not. Former Production Director Hannes Seifert will take over as head of the studio. Square Enix didn't clarify what projects have been canceled but along with the Hitman franchise, IO Interactive is also responsible for the Kane and Lynch games and, from way back in 2003, the sadly-underrated Freedom Fighters.